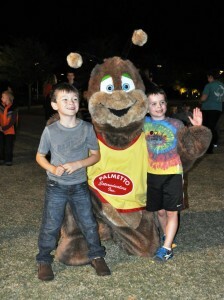 This past month Palmetto Exterminators had the privilege of participating in our local Light the Night Walk. 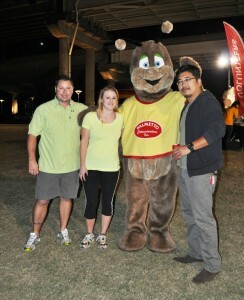 It was a fun event for our employees and their families. While there is not a video of our walk just yet, watch the video below to see what a walk really looks like. 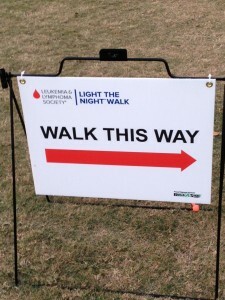 Light The Night is a fundraiser for the Leukemia and Lymphoma Society. Walks are held all across the state and the country. 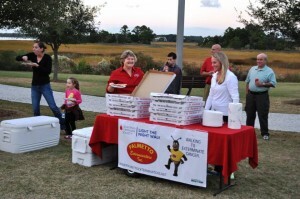 Palmetto Exterminators employees and families from the Charleston and Summerville branches participated in the Mt. Pleasant, SC walk for Cancer. We had over 60 team members and came in 4th on the list of Top Fundraisers. The money raised from these walks help fund treatments that save the lives of patients today. The funds also provide patient support services, advocacy for lifesaving treatments and the most promising cancer research anywhere, right now. “LLS is the world’s largest voluntary health organization dedicated to funding effective treatments for blood cancers, bringing us closer than ever to cures.” LLS. The money from our walk goes towards national research, but also to helping local patients. This makes for a very inspirational night. Our night started with a picnic pizza dinner at Mt. 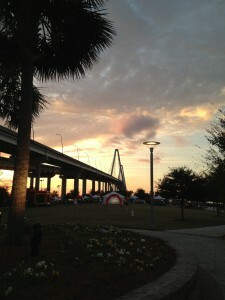 Pleasant Waterfront Park. Rocky the Roach made the rounds and was a big hit with the kids. Rocky even got in a few dances listening to The 3 Dudes Band play on the main stage. 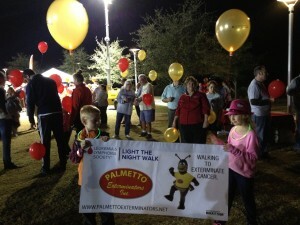 Just before the opening ceremonies team Palmetto picked up their balloons in a mix of red and gold. Red balloons represented supporters of the Leukemia & Lymphoma Society as well as supporters of patients and their families. Gold balloons represented those individuals walking in memory of a loved one who has passed from some form of Leukemia or Lymphoma. Each balloon lit up, which was quite a site in mass. All in all it was a great night. All of us at Palmetto Exterminators were honored to support patients, survivors, research and all who help to exterminate cancer.